Cognitively, your little one should be starting to notice patterns in her world and be able to identify things that match. In fact, you may find her starting to organize and sort things by color this year. Speaking of color, this year she should be learning to identify and label them and use them to describe things. For example, rather than just pointing out a car, she will start to point out the red car. She will also be noticing more and more the differences between boys and girls and should be able to identify the gender of people around her. She will be continuing to be able to identify items in pictures and will also start to be able to identify actions in pictures while reading. And reading! This year your little one will go from enjoying short, simple stories to wanting to sit for longer and longer periods of time and will enjoy stories of longer length and complexity. It is during this year that I have to slowly move from reading 2-4 short books at bed time to only 1-2 longer books. They don’t call this time the “terrible twos” for nothing. This time period is notorious for tantrums and generally resistive behavior. The mix of rapid cognitive and receptive language development with a not as quickly developing expressive language development can cause some stressful situations but it will pass soon. Remember to stay calm and remember that your child is just as frustrated as you are so relax and give your little one a hug. During this time, her play skills are also becoming more complex. She is doing a lot of parallel play, where she plays alongside her peers and may imitate some of their play movements. She is imitating what she sees in her life within her play. For example, she might prepare a baby’s bottle and feed the baby like you do for her baby brother (or, she may pretend to breastfeed her dolls if you or someone close to her is breastfeeding). She may “prepare” food in her kitchen much like you do and serve it to you. Around 2 1/2 you will start to see more imaginative and pretend play. She will start to be able to play simple games that require turn taking with yourself and she will begin to be interested in and start to take part in cooperative play around her 3rd birthday. During this time, she should enjoy the company of her peers even if she is not quite playing with them yet. Receptively, she is understanding a lot these days. She can identify many body parts when asked and is answering simple who, what, and where questions. For example, if you ask where a cow lives she might tell you on a farm. She is also slowly answering more and more yes/no questions. Does a horse say moo? Do we put socks on our hands? She is starting to understand more complex language. She can follow multistep directions now and is learning more and more new words daily. For example you should be able to tell her to go get her teddy bear and put him in the baby bed or go under the table, get the block, and put it in the box. And she is really starting to have a better grasp on the meanings of words like up vs. down and in vs. out. She is learning prepositions, verbs, adjectives, and nouns every day! Expressively, your little one should be pointing and naming items of interest in books and all around her. In fact, she is probably sharing with you CONSTANTLY the things in her environment she finds cool. Animals, toys, ceiling fans, food, etc. During this time frame, she will go from just starting to out two words together, to making simple 2-3 word sentences, to (at age three) starting to speak in longer and longer utterances. Just like receptively, she is using more and more new words every day in her speech. She is learning verbs, pronouns (I, You, He, She, It), question words (who, that, where), prepositions (locative words like on, under, in), and of course nouns and adjectives. In fact, vocabulary wise at the beginning of this time (2 years) your child should have an expressive vocabulary of approx 200 words but at the end of this time (3 years) she will have closer to 900-1000 words! 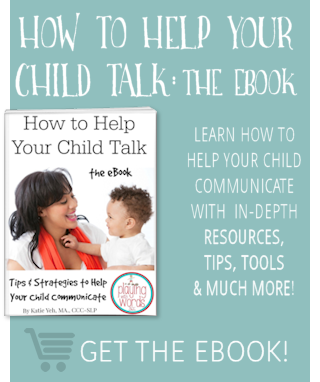 Regarding the actual development of speech (the process of making the individual speech sounds in our language) your child should be starting to produce more clear words, phrases and sentences. She is working hard perfecting the articulation of many speech sounds and her speech, by her third birthday, should be at least 75% intelligible to s stranger of not more. She should have mastered the production of p,m,h,n,w,b, and should have mastered or on the way to mastery (producing it correctly sometimes or most of the time) the k,g,d,t,f and y. By the time your child turns three, these patterns above should be gone or nearly gone in most of his words. For example, he should be starting to say “cat” rather than “tat” and “water” rather than “wawa.” There are other simplification patterns that your child will continue to use past age three, like gliding (substituting a /w/ for the /r/ and/or /l/ sounds like wabbit for rabbit and pwane for plane). Despite these patterns, his speech should still be 75%+ intelligible. If your three year is very hard to understand, she could have an articulation delay that will need attention from a speech pathologist. 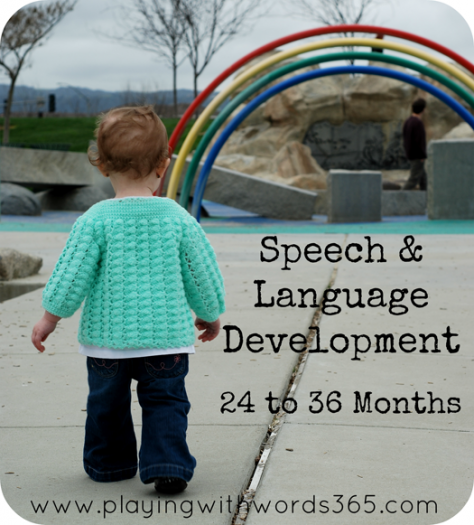 You can read more about speech development HERE and more about phonological processes HERE. 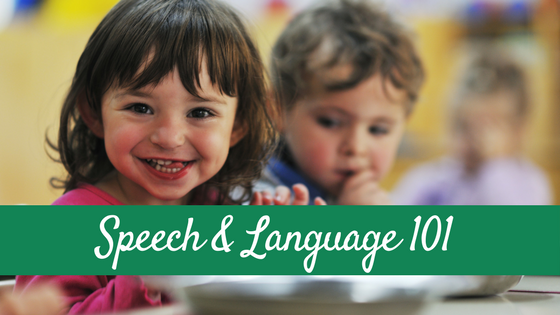 You may notice your child repeating some words and sounds in his speech. This might sound like “stuttering” and many parents find this alarming. 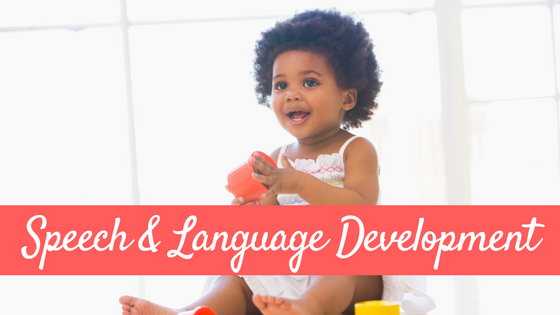 During this year, your child’s language will quite literally be exploding and growing at a fast pace. 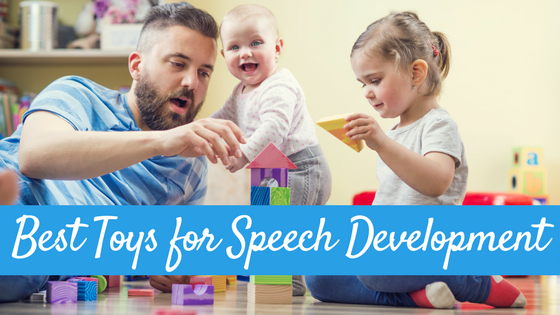 His receptive language (what he understands) and his cognitive abilities (how fast his brain is thinking) often are much faster and more developed than his expressive language and his motor planning skills for speech. This can sometimes cause what we refer to as “normal disluenlcies.” This basically means that some limited stuttering-like behavior can be normal between 2-5 as your child is developing his speech, language, and motor planning skills. 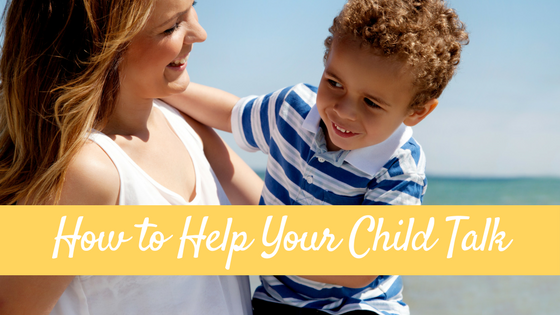 That said, if your child is really struggling to “get the words out” and he seems frustrated, you might want to have a speech pathologist take a look to be sure. You can read more about stuttering HERE, and I’ll touch on this again in the next two installments of this series. 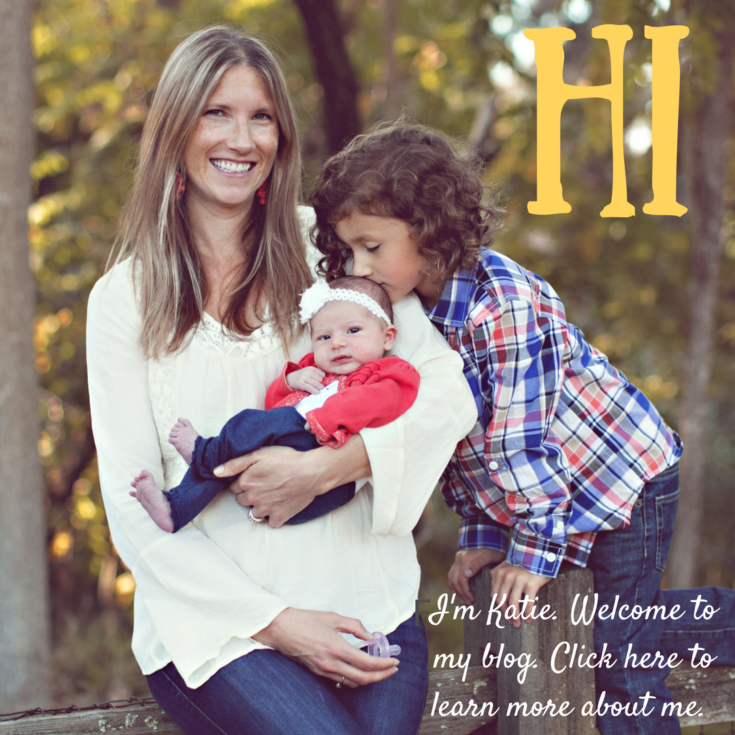 In the next year from 3-4 your little one is not so little anymore…she is a preschooler! How does her speech and language develop? Check back next Wednesday! Thank you so much for taking the time to post such wonderfully informative articles. I find the whole process of childhood language acquisition truly mindblowing. We are raising our children bilingually (with me speaking non-native French only with my children) and, I think the decision to do so has made me even more preoccupied with language development than I would have been anyway. Reading your posts has really helped to reassure me that we are doing ok.
Bonne I love that you are raising your children bilingual! They are so lucky 🙂 Good luck and let me know if you have any questions, I am so glad to have you here! Hi! I found your blog from a pin on pinterest. I am excited to read more, because my 3 year old is currently in speech therapy for articulation (the previous year was for expressive language). What caught my eye on pinterest was the picture – I have been to that park! I just read you post. Actually I try to read all your posts that pertain to my DS. I was wondering if you could give me some feedback. Last month my DS had his speech therapy review and his SLP officially diagnosed him with Apraxia. She has hinted around to it for quite sometime, but she just made it official a couple of weeks ago. Last week, I took my DS to see a Developmental Pediatrician (I requested it because my son has texture issues with food and his delayed speech) at Shands and he told me that it was way too soon to diagnose Apraxia and that he didn’t think he was apraxic. He feels my son is at a 24mo level and my son is 28mo, so he’s a little behind. He said his delayed speech and feeding issues could be due to weak muscles. He also stated that children with Apraxia usually have other issues and that my DS does not. I told the SLP this and she wasn’t surprised. She said something about it’s not uncommon to hear that it is too soon to diagnose. She also said that if his issues were due to weak muscles, you would visually be able to see it. She said weak muscle tone is called dysarthria and my DS did not have that problem. I forgot to mention that my DS, until the past 2 weeks used to chew on everything and he can bite hard. So, I’m not so sure about the weak muscle tone — although this could not have anything to do with it. I’m kind of at a loss here. Although, it was nice to finally have a diagnosis, so we can move forward on a plan. It was also nice to hear that my son doesn’t have apraxia. So, I am right back where we started. Obviously, I am going to work with my son under the assumption that he does have apraxia. Can someone have CAS without other issues? Or are his feeding problems considered an issue? Could he have weak muscles and not have dysarthria? Katie, I cannot tell you how much I have enjoyed this series! I just finished reading the 4-5 year post (my daughter is 5), but then came back to this one again (my son is almost 2 1/2). It is so fun to see where they fit in on the giant spectrum of speech and language acquisition! Thanks for putting this all together!! Carla recently posted..Thanksgiving Preschool Science Experiment!! Thank you for your article, I wanted to let you know although the last message is from 2012 it helps first time parents in 2017 to deal with the speech delay, we have been working with our son since February and still waiting for speech therapy, but he is improving a lot. and I mean a lot. hopefully by the time he starts therapy he will be up to speed. This makes me so happy! Thank you for your message!